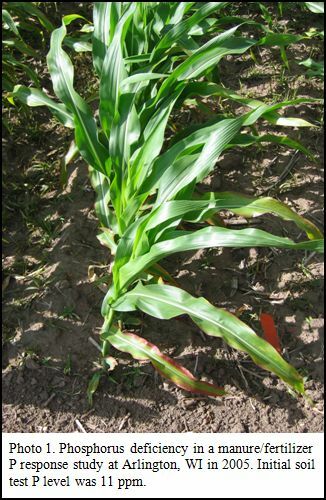 There are some corn fields in Western Wisconsin and perhaps elsewhere in the State that have the purple colorations associated with P deficiency (Photo 1). Growers with these fields are concerned that their P fertilization strategy failed this year. However, field conditions should be considered before jumping to this conclusion. Soil test P levels provide guidance on the probability of a yield increase when P is applied and the amount of P needed. Soils testing in the optimum category (~15-20 ppm for silt loams and 23-32 ppm for sands/loamy sands) have 30-60% probability of having a yield increase when P is applied. Excessively high P testing soils (>30 ppm for silt loams and >42 ppm for sands/loamy sands) have less than a 2% probability of a yield increase when P is applied, and yield increases may not be profitable. Under good growing conditions, visual P deficiency symptoms are unlikely to be seen on soils testing optimum or greater. Corn was planted when the soil was too wet. Planting in wet conditions can lead to sidewall compaction. Roots of young plants are restricted to a narrow band and can temporarily exhaust the P supplying capability of the soil in that small volume of soil. Once roots penetrate the sidewall, the plants can access a greater volume of soil and more P. Applying more P to increase soil test levels into the excessively high category may not eliminate P deficiency associated with sidewall compaction. Compacted soil. Roots don’t explore as much soil when the soil is compacted as a result of trafficking or planting in wet conditions. Poor early season weather. Slow crop growth can occur under unfavorable growing conditions such as too little heat and sunlight as well as too little or too much rainfall. In cool weather the crop is slow to grow and roots grow slowly as well. If conditions are wet, roots may not explore a large volume of soil because the plant can take up adequate water in a limited soil volume. Limited root exploration of the soil will limit uptake of immobile nutrients like P.
If corn fields are showing P deficiency on optimum or greater P testing fields, it is likely that limited root exploration of the soil is the “root” cause of the problem. Once the root system is larger, the P deficiency will be eliminated. While the weather cannot be controlled, growers should take actions to eliminate/minimize compaction to avert temporal P deficiency problems in the future.